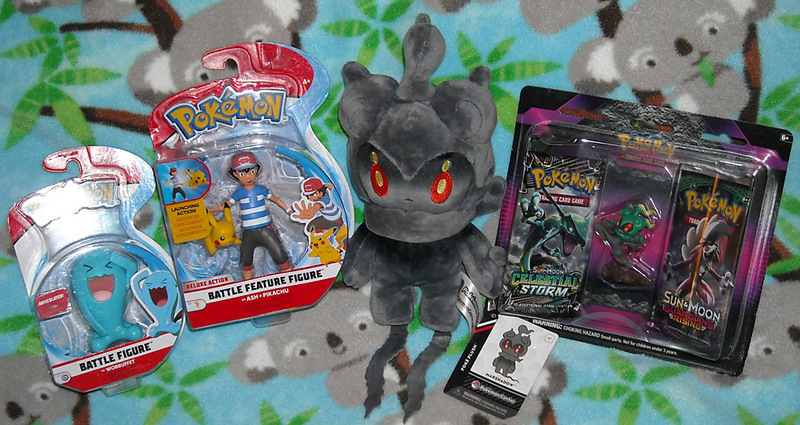 Home Pokémon Pokemon News Wickedly Cool Pokémon Swag Emerges from the Shadows! Wickedly Cool Pokémon Swag Emerges from the Shadows! What a week for staycation, we’re starting to see the new season shelf resets take place at many major retailers that carry toys. There’s a major gap left by the closing of Toys ‘R’ Us, but it seems like retailers are working hard getting new swag out for sale if I’m to judge by the awesome new merch I spotted at the likes of GameStop, Target and Wal-Mart. After checking GameStop’s website last week, I noticed new Pokémon Center items online, so I raced over there around lunch time to nab this cute little Pokémon Center Marshadow plush. GameStop had new cases of Pokémon Center plush including Groudon, Kyogre, Jigglypuff and more… and… new cases of the Wicked Cool plush including the Sun/Moon starters, Pikachu, Ditto and Meowth! Target added more Wicked Cool items including articulated figures like Wobbuffet and this launching action Ash with Pikachu! The biggest surprise upon which I stumbled would have to be at Wal-Mart, where shelf reset is still somewhat messy as they clear out last season’s strays—there was a big cardboard end cap display featuring TCG blister packs containing figures! Those big TCG gift sets with figures can get pretty pricey, so it was a nice surprise to see a blister with just two boosters plus an awesome Kaiyodo figure for under $10! The two figures I saw enclosed with the blisters were Alolan Raichu (which I’d already obtained via a bigger gift pack) and the Marshadow that I selected this purchase. I’m not sure how Funko Pop! restocking is going at Target this week, as I don’t have home internet, but hopefully that shapes up well for fans that missed the first shipments (I’ve yet to see them on store shelves, they pretty much sell out straight from the shipping cases). Meijer has not yet started their reset, really looking forward to seeing what items they will have in their inventory for the holiday. I’m also keeping my eyes on close-out stores because I’m puzzled about what became of the tail end of Tomy’s Pokémon stock (which never made its way to most store chains; TRU had a few of these items right before they closed, but not all). Don’t forget September is Save the Koala month (www.savethekoala.com)! #TeamKomala PIKA!